Spit it Out! Is Saliva Important? Saliva is something we take for granted every day. Little do we know, saliva plays a huge role in our health, and is integral to a strong digestive system. For starters, we need to understand what saliva is, and all the ways it benefits our bodies. Saliva is a liquid found in the mouth and digestive system comprised of water, mucus, proteins, minerals, and a digestive enzyme called amylase. While small amounts of saliva are sent from glands around the cheeks, lips, and tongue at all times to maintain moisture, the real work begins when you eat, smell, or even think about food. When this occurs, larger amounts of saliva are released into the mouth in preparation for breaking down and digesting your food. Research has shown that saliva helps protect against gum disease and tooth decay, and your teeth are constantly covered with a thin film of saliva to defend against harmful bacteria. Saliva also carries minerals that help rebuild the enamel surfaces of your teeth, and neutralizes acids in the mouth that would add to the enamel breakdown. Speaking of rebuilding enamel, it’s important to understand how saliva is able to neutralize those acids to protect the enamel of your teeth. 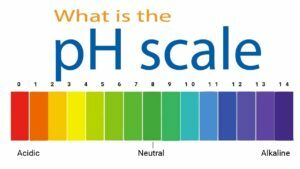 The pH scale is a system of measuring the acidic or basic qualities of a chemical, 0 being the most acidic and 14 being the most basic. Water has a pH of 7, meaning it is completely neutral. Saliva’s normal pH range is anywhere between 5.6 and 7.9. The pH of saliva changes with any food or drink you consume. It is important to maintain healthy eating habits to keep your saliva’s pH as balanced as possible, as saliva that is too acidic or too basic can cause problems both in your mouth and potentially to your digestive system as a whole. Do I Make Enough Saliva? Some people simply don’t make enough saliva. The technical term for dry mouth is “xerostomia”, and certain health conditions can be a factor in dry mouth, such as diabetes. Some medications even cause dry mouth, such as medications for allergies, high blood pressure, and depression, among others. The uncomfortable sensation of dry mouth is just one adverse effect; larger problems can start to occur if the condition is left untreated, such as gum disease and tooth decay. You can even have trouble swallowing and digesting food. If you have a dry mouth, you can follow these tips to stay comfortable and, more importantly, avoid damage to your mouth and body as a whole. Drink plenty of water. Dehydration is a leading cause of dry mouth. Chew sugar-free gum or try sugar-free candy or mints. These can stimulate saliva production. Brush and floss your teeth every day. If your symptoms persist, ask your hygienist if artificial saliva, such as a rinse or a spray, would be beneficial in your case. Avoid spicy, salty, or acidic foods. These tend to dry your mouth and even cause irritation. Look for softer, smoother foods, and moisten dry foods with sauces or broths. Saliva is incredibly important to our bodies, and vastly underappreciated. Without it, we couldn’t digest our food properly and our mouths would be teeming with harmful bacteria. Questions about your mouth’s health? Experiencing symptoms of dry mouth? Call Susquehanna Dental Arts today at 717-285-7033 to schedule your appointment! Posted in Informational, Oral Health and tagged dry mouth, oral health, pH of saliva, saliva on September 19, 2018 by admin.